I don't know much about Rolles Jr (and I'm still not completely sure whether his father should be spelled 'Rolls' or 'Rolles', as I've seen both. I think it is the former, but then why is it 'Rolles Jr'? ), except that he is probably the largest member of the Gracie family and has had a successful MMA career, despite that one slip-up the UFC. These aspects of Rolles would both feature prominently in the seminar, which kicked off with a refreshingly humble tribute to his uncle Rilion (who has influenced his teaching too: the style felt similar to yesterday). Rolles noted that it felt strange to be the teacher while his own mentor was stood a short distance away. My last bit of training for the Texas trip kicked off with a takedown, where Rolles noted that he prefers the upright posture of judo. My groin injury meant I couldn't really take part, but there were still a number of handy details I could take away. The initial grip looks especially useful: reach over the back and grasp a clump of gi near their shoulder blade, then bring your elbow down past their shoulder. This gives you a brace that can prevent them driving in for their own takedown. I can't remember the actual takedown very well, but from what I recall, drop down with your knee raised on the outside, wrapping their leg, still holding onto their gi. Pull on the gi as you drive and lift into the leg, corkscrewing them into the mat to establish side control. Getting to the ground, the focus was on closed guard. 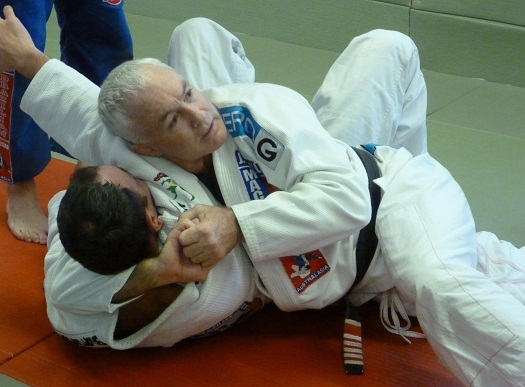 Rolles commented that as a big guy, he found that people often clammed up in his closed guard, staying defensive with elbows pinning his hips,head in his stomach and knees tight. It is difficult be offensive when confronted by that lack of space, but Rolles has developed a solution. For the armbar, start by grabbing their same side armpit to get a fistful of gi material, then clamp your elbow to your side. Your other hand goes into their collar, again on that armpit side. At this point, many people won't react as they don't worry about the choke until your second hand comes into play. Your hips are stuck, so instead, open your legs and straighten them, then swivelling off their thighs, bring your knee on the collar arm side in front of them. Shove that up by your collar grip (or the other side of their head, if you prefer), bringing your other knee up as well. From here, you can squeeze your knees and pull on their collar and armpit, trapping that side of their body. With the foot of your collar arm leg, push into their same side knee, just like the push sweep. This will put their torso to the mat, flat on their stomach. Due to your grips, it should also stretch out their arm. Bring your armpit side leg up their back to pin their shoulder, mirrored by your knee on the other side (rather like Levo's pressing armbar). Switch your collar grip to your own collar, in order to secure their wrist. It is now possible to turn your top knee down to the mat past their shoulder and go for a belly down armbar. If they roll, maintain your grips and follow them, then complete the submission from mount. If they are a bit more savvy and grab the foot of your collar side leg, to stop you pushing their knee out, turn towards the other side, pressing into their hip with your armpit side foot. This sets you up for a triangle. Swivel the leg they are holding around their grip (you should be able to beat their grip on this, though that becomes more difficult if they manage to slide their arm further down your leg), then move into a triangle as normal. Finally from that position, you can sweep them over your head. This time when you've got your knee into position, they stand up. Pull them in, raising your elbows up by your head, then put your feet on their hips and roll them past your shoulder. Again, my injury wasn't up to this, so I just continued with the previous techniques from earlier. The second half of the seminar was nogi, or more specifically, MMA. I wasn't expecting quite so much relating to working off strikes, but then I guess Rolles is known for his MMA, so that shouldn't be too surprising. The initial takedown begins with a few jabs to judge the distance, after which you move straight into the clinch, reaching through to their far shoulder. Shuck their shoulder (particularly if they push on your head) then slide to their back, gable gripping your hands together. You want to control a little below their hip, twisting you lower hand to dig your forearm in firmly. This isn't comfortable. Move forward to put them onto their knees, so that you can then progress to attacking the turtle. You have one knee on the mat, the other leg over their back. Punch their head on the leg-down side to get them to cover with that arm, to create some space to insert your hook. Your arm on the other side wedges inside their leg, effectively becoming a hook. Roll them over, then either establish your second hook, or go straight for the rear naked choke. A quick tip on that was to grab the shoulder with your choking arm, not releasing it until your second arm was most of the way into position. That's because it is harder to pull your arm down if you're grabbing the shoulder, as opposed to open because you're about to weave it by your other bicep. If you can't get that initial hook with your foot, simply jam your elbow into the other hip, bring your knee out slightly on what would have been the initial hook side, then drag them into that space you've created. That should roll them, so you can now insert your hook and move on for either both hooks or the RNC like before. Finally, should they attempt to escape your back control, Rolles did a body triangle type counter, which I definitely couldn't do with my injury, but I was able to follow the head and arm choke counter he finished off with. This was quite similar to John Will's technique, where from the seatbelt grip you pull your arm through and turn. Block their arm from escaping with your head (keeping in mind this only needs to be tight enough to block) until you can turn all the way. From there, sink down and jam your head in place, then cinch in the choke.